Revealing the optical track pointer and a design that’s slimmer than I expected, the port locations, backlight on the keyboard and lots more. As a tablet it’s ‘pretty thin and light’ says Johannes. It still weighs 1.2KG though so as a pure tablet, it’s a complete bloater! Full specs, price and other info available here. My thoughts – Why aren’t we seeing news about HSDPA/4G for the Vaio DUO? This is clearly an ultra mobile PC but without 3G, it’s missing something in my opinion. Still, enough people have Android phones that can help out with a little hotspot love. I love the look of that track pointer! 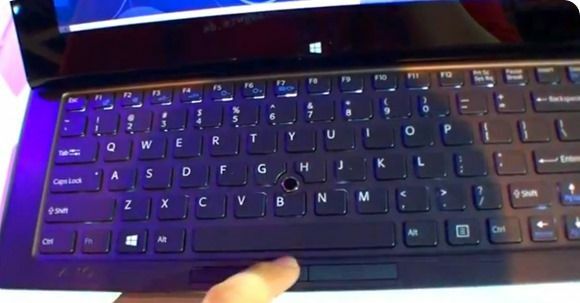 Personally, I’m more of a fan of detachable screens which is why I’ve got my eye on the ASUS Transformer Book. I’ll bet it’s going to be cheaper than 1200 Euros for a Core i3 too!